Interested in the various aspects of composting? Well, you've come to the right place. On our site you will find articles and hundreds of links covering all aspects of composting. With traditional birdhouses, you must dismantle and clean out the nesting material every mating season. Otherwise you run the risk of developing parasite infestation and bacterial growth in the compartment. 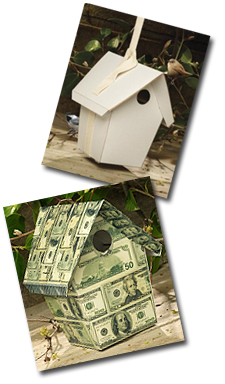 However, recyclable birdhouses eliminate the need for these seasonal maintenances. They provide you with an alternative way to attract native birds such as wrens and chickadees into your backyard for your viewing pleasure. As such, our efforts to eliminate waste through composting everyday items such as birdhouses have become part and parcel to sustaining a cleaner, greener earth. As bird watchers know, when you take a closer look at our surroundings, you will gain the sense that what is good for the environment will ultimately benefit us. It’s easy to turn your recreational activity into a contribution to nature through composting. What will you compost today? Click here to buy your recyclable birdhouse today.